Hi All! Recently I came across this awesome cashback shopping site named ShopBack and thought I should write a post about it to give you all an idea what’s ShopBack about and how do we do earnings from online shopping. 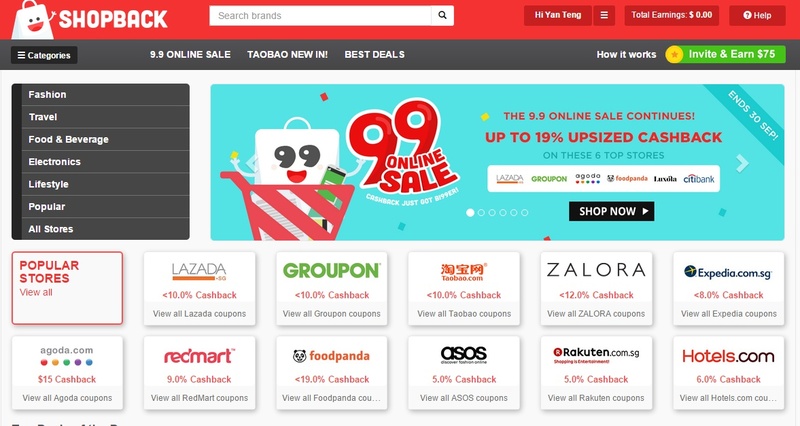 In ShopBack, we can find latest promotions and voucher codes from over 300 renowned brands in the online shopping scene, including Taobao Singapore, Lazada, eBay, Rakuten Singapore and Groupon Singapore, ShopBack is the one-site shop to get all the fantastic coupon deals at your favourite online shops. Not just getting discounts, ShopBack also allows us to earn cashback with each purchase. So how do we use ShopBack? and How Do we Get Paid? Cashing out is simple, just four simple steps! 1. Indicate your preferred bank account or paypal account here. 2. Click on ‘Total Earnings’ button on the navigation bar. 3. Navigate to ‘REDEEMABLE’ SECTION. 4. Check your redeemable amount and request for a cashout. Nowadays, online shopping makes our lives easier without needed to step out from our houses. Do you know we can even shop online for groceries and get them deliver to our door steps. We don’t have to worry carrying heavy groceries and home essential items back from supermarket. 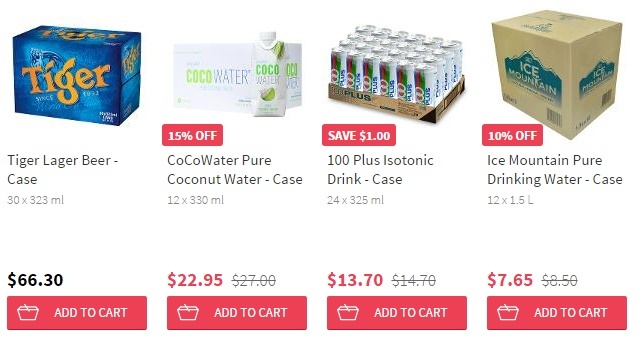 Redmart is the Singapore’s reliable online supermarket with delivery 7 days a week, allowing you to order anytime, anywhere, with thousands of groceries and home essential products at your fingertips! 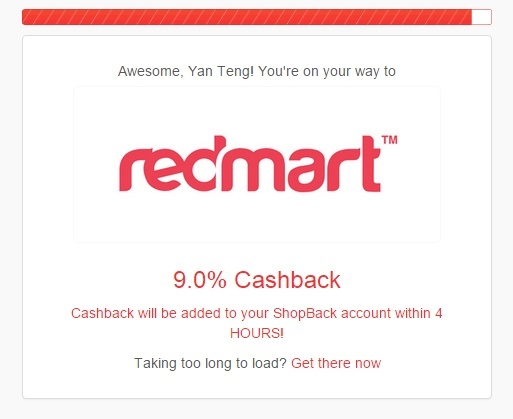 In ShopBack, we can earn up to 9% cashback when shopping in redmart! Other coupons with great discounts also available on ShopBack site to save your cost. In Redmart, there’s all sorts of groceries items you named it they have it. Buying in bulk, don’t have to worry about carrying back, Redmart will deliver to you. 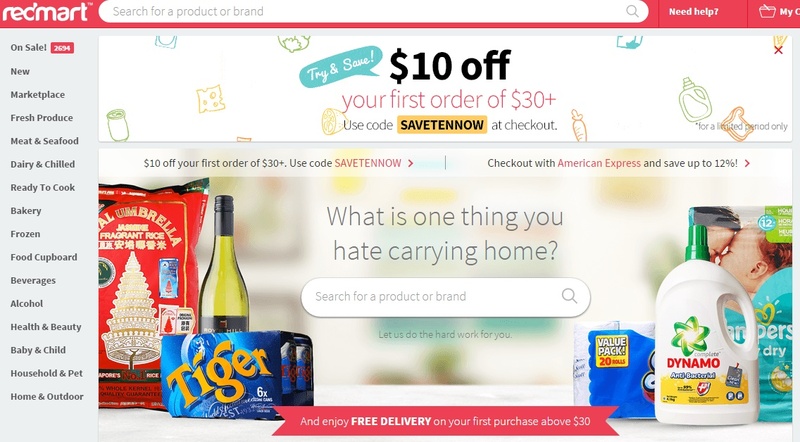 And the most awesome thing is we get to enjoy FREE Delivery on our first purchase above $30! 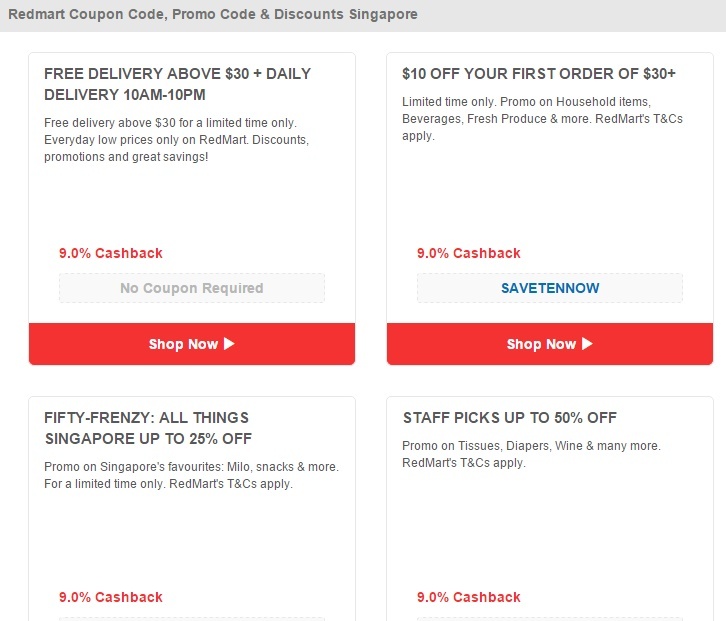 Besides Redmart, ShopBack also offered attractive cashback when you shop in Groupon (Up to 10% cashback) and for Japanese goods lovers, Rakuten (Up to 5% cashback)! In the month of September, ShopBack also having the 9.9 Online Sale! Enjoy bigger cashback till 30th Sept 2015, 9 top online stores 24 hours of upsized cashback on top of exclusive sales and promo codes.